My inspiration for the weekend is this week’s book, The Hairy Bikers’ Meat Feasts. It’s the ultimate meat cookbook with more than 150 recipes to get stuck in to. Meat Feast is a big and bold celebration of meat, packed with mouth-watering recipes from traditional favourites such as shepherd’s pie and chilli con carne to soups, salads, pies and curries. It has lots of handy tips on buying the right cut for your recipe and your budget and is really the only meat book you will need to start the year. So enjoy! Put the lamb in a bowl and season with salt and black pepper. Sprinkle over the flour and toss the lamb well. Heat the oil in a large frying pan and sear the lamb on all sides, making sure it is well browned. Do this in batches so you don’t overcrowd the pan. Heat the butter in a large, flameproof casserole dish. Fry the onions over a gentle heat until they’re well softened and translucent. Sprinkle in the spices and stir for a minute, then add the lamb, together with any juices. Add the herbs and stock. Bring to a boil, turn down the heat, cover the casserole and leave to simmer for 30 minutes. Add the apples and prunes, then simmer for another 30 minutes with the lid on, until the meat is tender and the sauce has slightly thickened. Set aside to cool. Sift the pastry flour into a bowl and add a pinch of salt. Rub in the diced butter and lard or vegetable shortening, then add just enough chilled water to make a firm dough. Lightly knead the dough until it comes together smoothly, form it into a ball, wrap it in clingfilm and chill for half an hour. Preheat the oven to 200°C/400°F/Gas Mark 6. 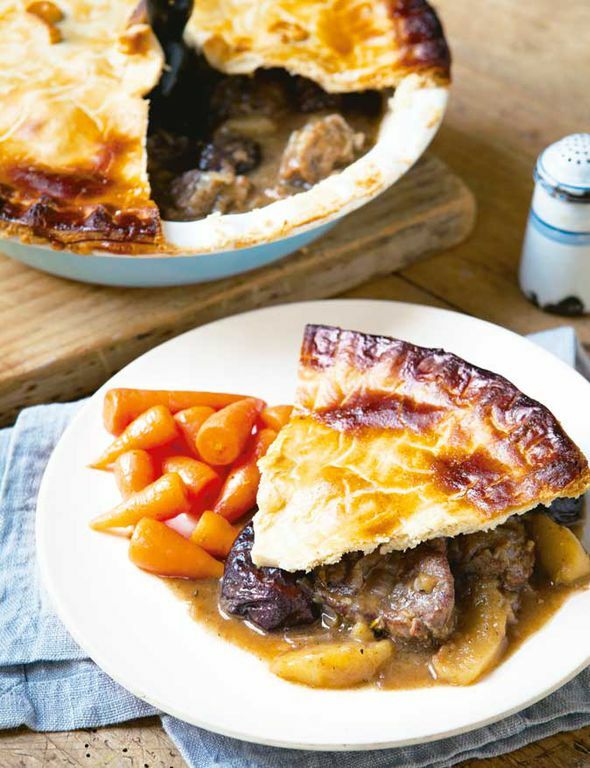 Put the lamb mixture into a large pie dish, placing a pie bird or funnel, if you have one, in the centre. Roll out the pastry on a well-floured surface, making sure it is larger than your pie dish, and cut off a 1cm strip. Wet the rim of the pie dish and line with the strip of pastry. Wet the pastry strip, then top it with the rest of the pastry. Press the edges together and trim, crimping decoratively if you like. Brush the pie with the beaten egg and bake it in the oven for 30-40 minutes. Preheat the oven to 200°C/400°F/Gas Mark 6. Heat a large, heavy-based frying pan and brown the meat, skin side down, for 5 minutes. Brown the remaining sides, then remove the racks from the pan. Place them in a roasting tin, facing each other, with the bones crossing at their tips. Mix the breadcrumbs with the herbs and crushed garlic, then stir in a pinch of salt and some black pepper. Brush the skin side of each rack with the mustard and cover with the breadcrumb mixture, pressing it carefully so it sticks. 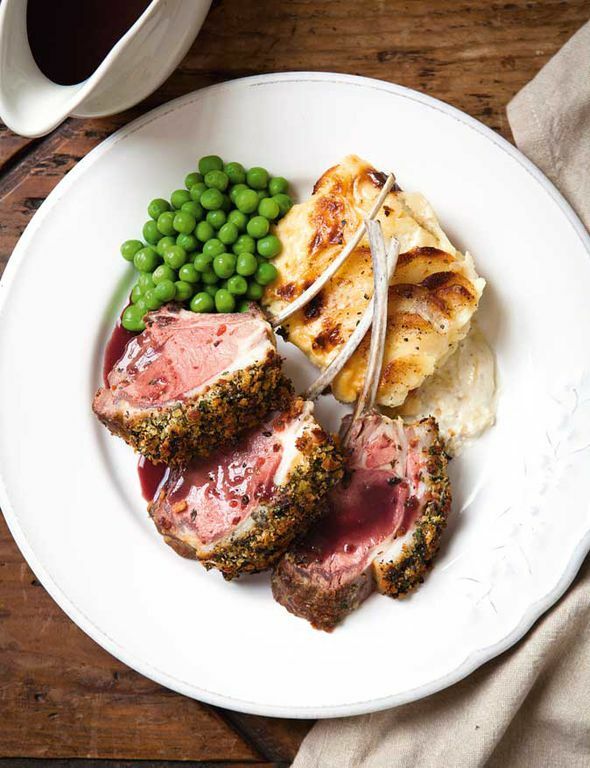 Roast the lamb racks in the oven for 25-30 minutes for medium-rare meat. Remove the racks from the oven, cover loosely with foil and leave to stand for 8-10 minutes. Carve each rack into individual ribs and serve with a red wine gravy. Dauphinoise potatoes go well with this and make for a really fine feast. 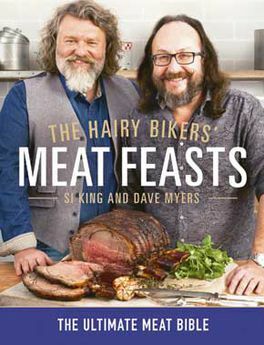 Recipes taken from The Hairy Bikers’ Meat Feasts by Si King and Dave Myers (£22, Weidenfeld & Nicolson). To order, call the Express Bookshop on 01872 562310, send a cheque or postal order payable to The Express Bookshop, to Express Bookshop, PO Box 200, Falmouth, Cornwall TR11 4WJ, or order online at expressbookshop.com.